In 1937, the notion of beaming radio waves off distant objects was barely more than speculation, yet in just six years the genius minds of AT&T's Bell Labs honed the technology into a potent weapon for the Allies. The Idea Factory by Jon Gertner discusses the fascinating history of the storied think tank. The Scientific principles of Radar were fairly straightforward, even if the details of the technology weren't. A memo to Bell Labs employees explained that radar could be defined as a powerful electronic "eye" that used high-frequency radio echoes to determine the presence and location of unseen objects in space: "Specifically, a radar system does the following: (1) it generates high power electrical waves; (2) it projects these waves from an antenna, usually in a narrow beam; (3) it picks up the waves which reflect back from objects in its range; and (4) converts these into a pattern on a fluorescent screen." The memo might have added that the waves traveled and bounced back at the speed of light, about 186,000 miles per second. Thus, in evaluating the time it took for radar waves to leave and then echo back to a radar antenna, a set could also calculate the distance of an unseen object based on the knowledge that distance equals rate multiplied by time. (Radar equipment was designed to divide in half the distance a wave traveled, since operators didn't need the distance to and from the object, only the distance in one direction.) It all happened instantaneously. An object one thousand yards from the radar set would give its echo six-millionths of a second later. Scientists who worked on radar often quipped that radar won the war, whereas the atomic bomb merely ended it. This was not a minority view. The complexity of the military's radar project ultimately rivaled that of the Manhattan Project, but with several exceptions. Notably, radar was a far larger investment on the part of the U.S. government, probably amounting to $3 billion as contrasted with $2 billion for the atomic bomb. 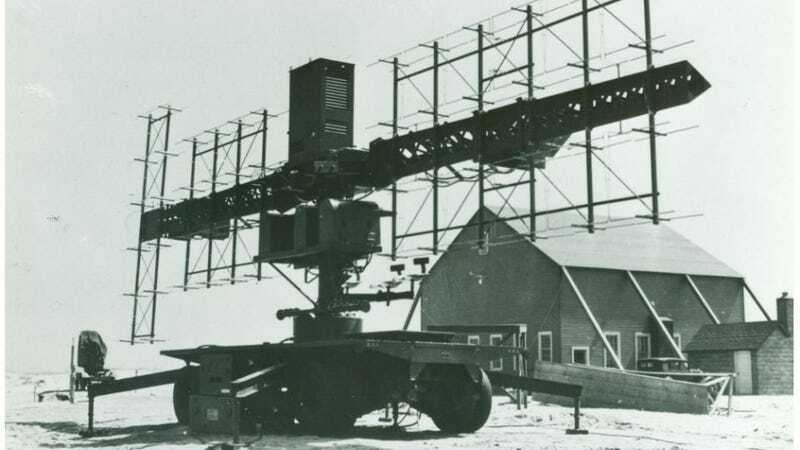 In addition, radar wasn't a single kind of device but multiple devices-there were dozens of different models-employing a similar technology that could be used on the ground, on water, or in the air. Perhaps most important, radar was both an offensive and a defensive weapon. It could be used to spot enemy aircraft, guide gunfire and bombs toward a target, identify enemy submarines, and land a plane at night or in thick fog. Its origins for domestic military uses dated back to the 1930s, when several scientists at the Naval Research Laboratory discovered that when they directed a radio pulse from a transmitter toward planes passing overhead some of the waves were reflected back. In 1937, the Navy approached Bell Labs to help it refine the technology. Those first applications were primitive and riddled with problems, but by the start of the war radar sets were being used in Great Britain, where an intricate network of coastal radar stations helped the British defend against the onslaught of German bombers. The U.S. military also used radar stations in the Pacific-indeed, the Japanese squadrons flying toward Pearl Harbor were picked up well before they arrived. The officers monitoring the stations disregarded their readings, thinking the blips to be friendly aircraft. In time difficulties like this were overcome-a method was devised to distinguish between friendly and enemy aircraft-but the rapid evolution of radar between 1937 and 1943, the same speedy development that had awed Kelly in assessing the innovative forces of war, was rife with frustrations. In early 1940, if one could by chance eavesdrop on a group of Bell Labs radio engineers discussing the ideal radar set, one would hear described a technology that with the help of vacuum tubes could transmit very brief electromagnetic pulses (perhaps a thousand per second) in a very focused beam of waves that measured perhaps ten or fifteen centimeters in length. This was a fraction of the length of regular radio waves, the ones that brought music and news, which were sometimes a hundred meters long. It was also an ideal and not a reality. At the start of the war in Europe, the vacuum tubes that powered the early radar sets mostly sent out longer waves measuring a meter or more in length; such waves were too diffuse to help "pilots home in on their quarry." And when American scientists attempted to create sets that could emit shorter waves of thirty or forty centimeters, they discovered that their vacuum tubes lacked the power to send out a strong enough signal. "The big problem in radar is to generate enough power to get a detectable echo from a distant point," Time magazine explained. "Of the total energy sent out in a radar beam scanning the skies, only a tiny fraction hits the target (e.g., a plane), and a much tinier echo gets back to the receiver. Engineers estimate that if the outgoing energy were represented by the sands of a beach, the returning echo would be just one grain of sand." How to create a device to send out shorter waves, and with more power? There was a solution to this problem-it came by ship, in a veritable black box, by way of a secret mission to the United States by British scientists in the late summer of 1940. In the box was something called a cavity magnetron, a metal device invented by two physicists at the University of Birmingham that resembled a small fishing reel. "Unlike conventional vacuum tubes," a Bell scientist explained, "with their components exposed in a glass envelope, the new tube was an inscrutable copper cylinder with cathode leads and a coaxial line emerging from it." The magnetron whirled electrons inside its six or eight circular internal cavities to produce short waves of ten centimeters and transmissions of great power. It was brought to Kelly at the West Street labs not long after the British mission came to the United States-the idea was that Western Electric would be the logical company to mass-produce the device if Bell Labs could refine the technology and design. On October 6, Kelly watched as the magnetron was demonstrated for the first time in the United States at a small Bell Labs branch office in Whippany, New Jersey. The engineers in the room were dumbstruck by its power output. It wasn't just an incremental improvement in radar engineering. Luis Alvarez, a physicist who wasn't present that day but would later work directly on the magnetron designs, pointed out that the invention improved upon current technologies by a factor of three thousand. "If automobiles had been similarly improved," he noted, "modern cars would cost about a dollar and go a thousand miles on a gallon of gas."